‘Tis the season to make eggnog cupcakes. 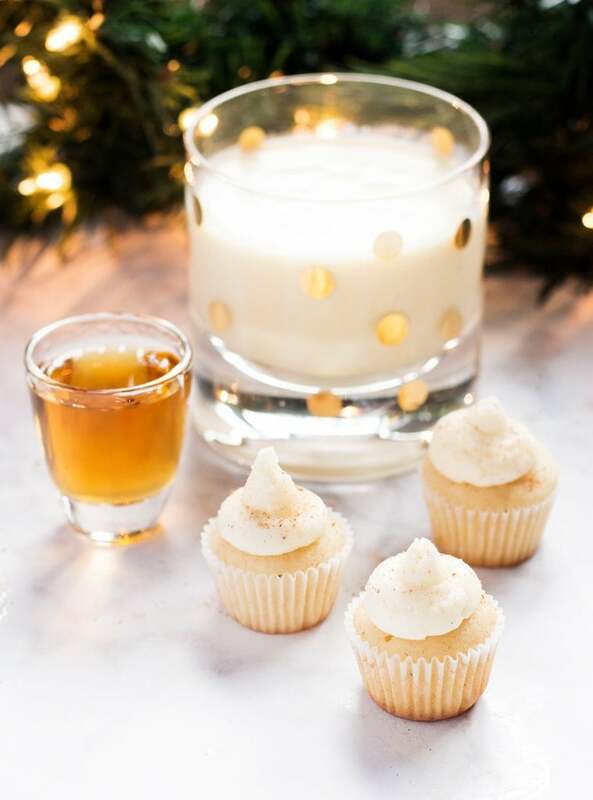 Spiked with bourbon and sprinkled with nutmeg, this cupcake version of the holiday cocktail is a crowd pleaser. Let the holiday baking commence! 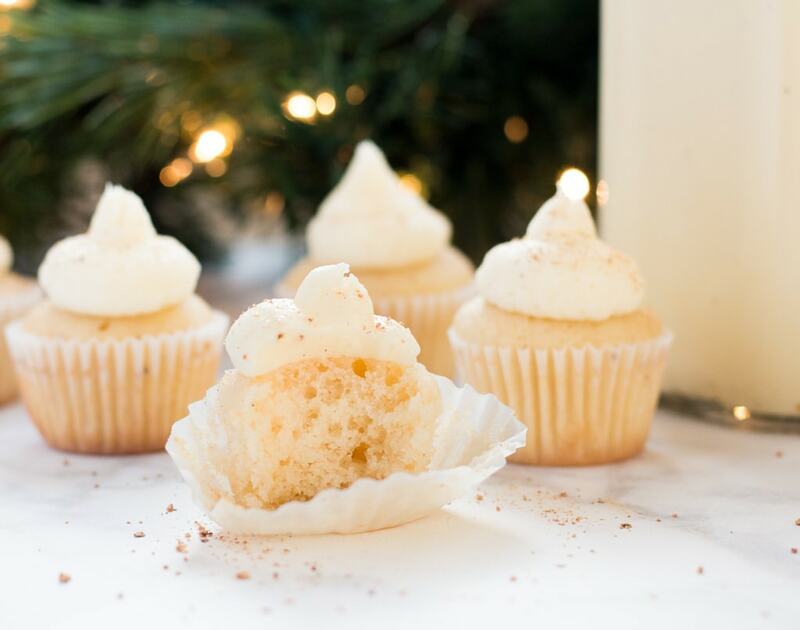 This season is full of delicious goodies on If You Give a Blonde a Kitchen including these mini eggnog cupcakes. I made them over the weekend for a holiday party and they were a hit! Mini cupcakes are one of my favorite things to make when I’m going to a party. The bite-size portion is perfect for large groups—everyone gets to try the dessert without committing to a large portion. And, let’s be honest, we all feel a little less guilt eating two or three mini cupcakes than one whole one! So with the holiday season here, I was eager to make eggnog cupcakes spiked with bourbon. Eggnog is truly one of those flavors that can only be eaten around Christmas. Unless you’re going to make eggnog from scratch, December is the only time when you can find it in stores. I try to take full advantage of that during the holiday season and incorporate the festive drink into desserts. Turns out eggnog is an excellent ingredient for cupcakes. 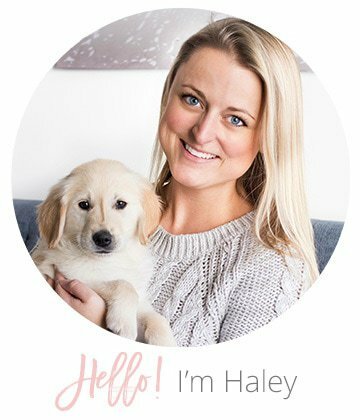 It lends a delicious flavor to both the cake and the frosting without being overwhelming since the cupcakes are bite-sized. To make the eggnog cupcakes truly like the yuletide cocktail, I incorporated bourbon into the frosting and also brushed each cupcake with bourbon as well. This turned out to be the perfect spike for the cupcakes—just enough to taste, but not overwhelming at all. The guests at the holiday party loved the idea of spiked eggnog cupcakes too. Not only do they taste great, but you get a dash of alcohol too. During the holidays, anything goes, right? Preheat oven to 350° F. Line a mini muffin tin with cupcake liners. Set aside. Whisk together flour, sugar, nutmeg, baking powder and salt in a large mixing bowl. Set aside. In a large bowl with a hand mixer or a stand mixer fitted with a paddle attachment, beat together butter, egg whites, vanilla, eggnog and milk and on medium speed just until smooth. Slowly add in flour mixture and mix just until combined. Do not over mix. Fill prepared cupcake liners a little more than half way. Bake 12-15 minutes or until a toothpick inserted in the center comes out clean or with a couple crumbs on it. In a medium bowl with a hand mixer or a stand mixer fitted with a paddle attachment, beat butter until fluffy. Gradually add confectioners' sugar until combined. Add in eggnog 1 tablespoon at a time and then the bourbon one teaspoon at a time. Add additional eggnog or bourbon to reach desired consistency and taste. Transfer frosting to a bag fitted with a tip. Brush cooled cupcakes with bourbon (optional step). Frost cupcakes and sprinkle with nutmeg. Store cupcakes at room temperature in an airtight container. Cupcakes are best served the day they are made, but can be eaten up to 4 days after baking. Cupcake recipe inspired by Life, Love and Sugar. You can’t just add a whole extra 1/4 cup of liquid to a recipe without counterbalancing it with either less of another liquid or more dry ingredient. So, if you add the 1/4 cup bourbon, do you not add the 1/4 cup milk? Hi Sandy – If you read the instructions, you’ll see that the bourbon does not go into the batter. The 1/4 cup bourbon is used for brushing on top of the baked cupcakes, which is an optional step.